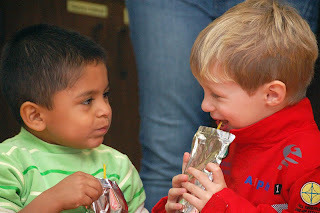 Dylan's preschool halloween/pumpkin day party... enjoying juice with his best school friend, Preston (pronounced pWeston by Dylan). 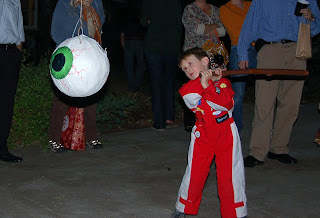 Make and Take Halloween Party at Serena's house, complete with backyard trick-or-treating stations, a pumpkin cartoon projected in the backyard, and an eyeball pinata. Pretty fun stuff. 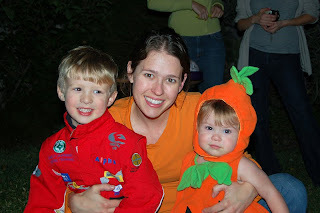 Mama and her little munchkins all dressed up and ready for candy! 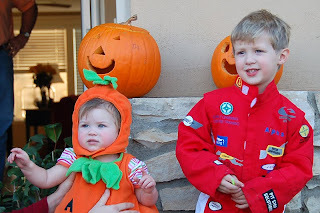 (Dylan is a racecar driver this year and Addie wore Dylan's pumpkin costume from when he was 16 months old). San Diego Halloween weekend with family. Pumpkins behind the kids are the ones that Dylan and Ryan did together. 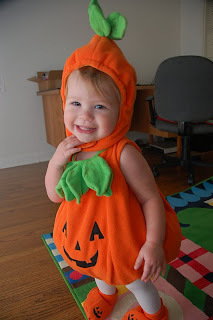 Who's this cute little pumpkin? 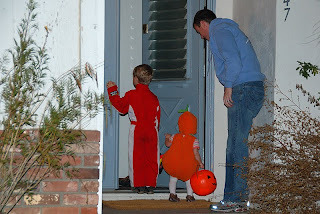 Trick or Treating in Ryan's aunt and uncle's neighborhood! P.S. Today is the 5 year anniversary of when we found out we were pregnant with Dylan. Happy Conceiveiversary. No announcements like that this year for us. But one of my best friends had her baby girl (baby #3) today. Welcome to the world, Taelyn! Dylan looks so much like you in these pictures! Addison, I'm not sure about, but she is a doll - especially in that pumpkin costume. Your kids are too adorable. I kept forgetting about your blog, then I saw a link on Kari-lynn's to remind me. Congrats on the new home! Lovely pictures.Your kids are so cute.They are adorable.